NEW for 2019 – The Sporting Life 10k Start Line will now be located at 1950 Yonge St. Toronto, ON M4S 3E5. This is just north of Davisville Ave. If you have any questions or concerns about the location and route changes, please contact Camp Ooch at: sl10k@ooch.org or 416-961-6624 ext. 403. Canada’s EASIEST and one of the fastest 10k’s anywhere! The course runs right down the middle of Canada’s most iconic street — Yonge Street! Whether you are a novice looking for an easy 10k course, or a seasoned veteran looking to set a PB, this is the event for you! Enter today to dash down Yonge Street while helping to send a kid with cancer to camp. Course details: The Sporting Life 10k start line and a portion of the route has been changed. Where: Sporting Life – 2665 Yonge St, Toronto (East side of Yonge St., four blocks south of Lawrence Ave, at Blythwood Road). Why: You need to get your bib in order to be able to run. Come early to pick up your bib and shirt! First proceed to the tent in the Sporting Life parking lot to pick up your bib. 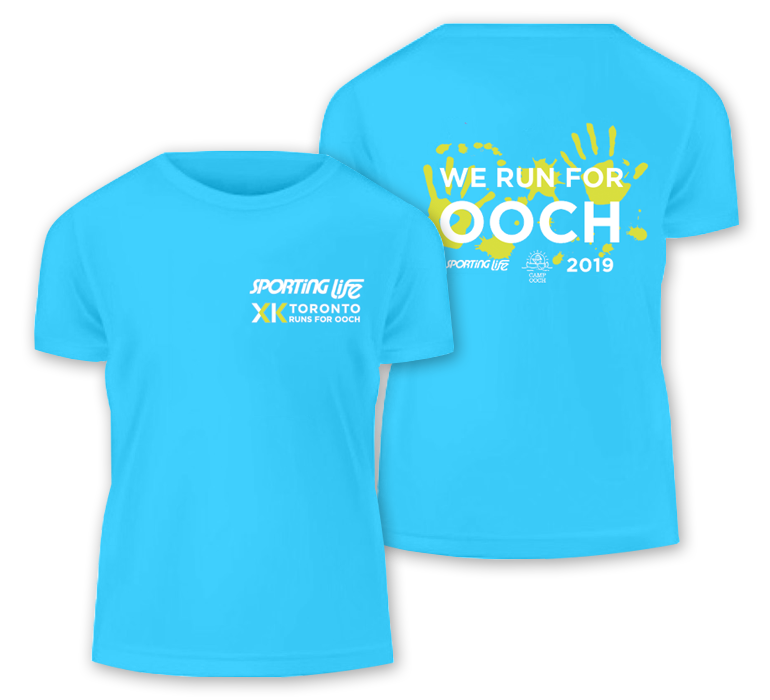 Then proceed into the Sporting Life store to pick up your technical running shirt. IMPORTANT! You will need your bib number – which will be emailed to you on Monday, May 6. Please bring a piece of photo ID or printout of your registration confirmation email. This isn’t a problem at all. If you are picking up a bib and shirt for a friend/friends, you must have their bib number(s). You will also need an e-mail stating you can pick up their bib and shirt on their behalf or a copy of their email registration confirmation. Sorry, there is no late/in-person registration at bib pick-up. Additionally, there will be NO shuttle bus tickets available for purchase during this time. Out of Towners: Run day bib and shirt pick-up is limited to those living outside 416/647/437 area code only. Be sure to know your bib number on race morning as it will be very busy. Run Day pick-up will be in the Sporting Life parking lot, 2665 Yonge St., from 6:00AM until 7:00AM. Due to the start line location change, please plan accordingly as the new start line is now 1.5km south of the Sporting Life 2665 Yonge St. location. To enable everyone to have the fastest and safest race possible, we will be utilizing a seven wave start this year. ALL PARTICIPANTS must be in your corral 15 minutes prior to the start of your “wave”. Please make sure to arrive early to get yourself organized. There will be coloured flags and signage at the start line that will correspond to the colour on your bib. You will only be allowed to enter the corral that corresponds to your bib color. You can change corrals through the Participant Dashboard, by logging in using the username and password you created when you registered. You will not be permitted to change your corral after Wednesday, April 17 or on the morning of the run. However, anyone can enter the 1:15 – 2:00 hours corral. There will be start line volunteers at each corral. Please follow the instructions of the volunteers as they will be guiding you forward just before your wave is scheduled to cross the start line. Timing: Sportstats will be using the Mylaps BIBTAG Timing system to time the run. With this technology, your timing chip or “bibtag” is placed on the back of your run bib. It must be correctly worn on run day for your run time to be accurately captured. 6:00am–7:00am Baggage Check will be on Yonge St. just south of Eglinton Ave.
6:00am–7:00am Run Day Bib and Shirt Pick-up for Out of Towners only in the Sporting Life parking lot at 2665 Yonge St.
*NOTE: Reminder that the new start line is 1.5km south of the Sporting Life Yonge St. store. Please plan accordingly. Due to the large numbers of participants in the Sporting Life Toronto 10k, and for safety and logistic reasons we regret that roller blades, bicycles, skateboards and dogs are not permitted in the run. All children 12 years of age and under must be accompanied by an adult due to the size of the run. Children must be a minimum of 8 years old to participate as a registered runner. Children under 8 years of age can be a part of the event if they are in a stroller or in a baby jogger. If you are planning to participate in the run using a baby jogger, please enter yourself in the 6th wave (Orange Corral). If you are planning to walk the run using a stroller, please enter the 7th wave (Pink Corral). Children in strollers are free, however, as they are not registered participants, they will not receive a: run shirt, bib or finisher medal. Arrive EARLY! Plan to arrive at least one hour prior to the start. This is the largest run in Toronto and will provide you with an experience like no other! Remember to give yourself plenty of time as there will be 23,000 people in this event, so everything from toilets to driving will take longer than normal. We strongly recommend that you carpool, take a taxi or take the TTC as there is only limited parking available on the side streets surrounding Sporting Life. 1) Take the TTC Yonge Street Bus to the start line — check the TTC website for bus schedules and bus pickup locations. There are lots of 24 hour streetcars and other buses to get you to Yonge Street: visit the TTC website for more details! Please note: the subway operates beginning at 8:00AM on Sundays. 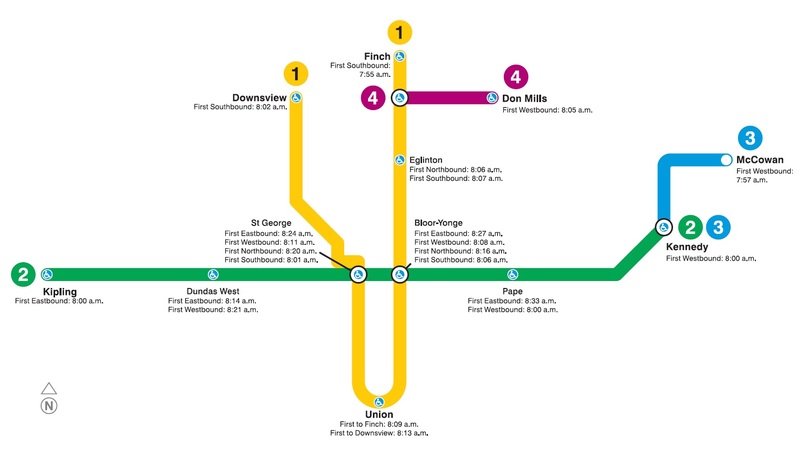 The first train Southbound from Finch Station leaves at 7:55AM, and the first Northbound train from Union Station leaves at 8:09AM. Click here for a detailed map. 2) Park in one of the parking lots near Yonge St. and Eglinton Ave. and walk south to the start line. After the run, take our complimentary shuttle bus at Ontario Place Blvd. & Lakeshore Blvd. (available from 8:30AM – 11:00AM) to St. Andrew subway station. Remember to bring a TTC token/PRESTO card or $3.25 cash fare. There is no bag check at the finish line — either leave your bag in your car, or bring it up to the start line and check it. It will be transported to the finish area where it will be waiting for you after you have completed your run. Due to the large scale of the event there will be several road closures on Sunday, May 12. Please allow additional travel time to reach your destination especially if you need to get across Yonge Street between Eglinton Ave. and Richmond St. and/or travel on Lakeshore Blvd. East Side of Yonge St between Roxborough St E and Rosehill Ave. Parking is available at Ontario Place in Parking Lot 1 ($15 charge applies). Parking is also available at Exhibition Place for $15. Bag check opens at 6:00AM at the Start Line Area. You can check your bag at the start for a suggested donation of $2 per bag (all proceeds go to Camp Ooch) and it will be transported to Coronation Park (party site/finish line area). Bag check is located on Yonge St. just south of Eglinton Ave. The bag trucks will be positioned according to your corral colour (i.e. if you have a blue bib, go to the bag truck with the blue flag). For security reasons you can only use the clear, plastic Sporting Life 10k run bag you receive at kit pickup to check your belongings. No other bags will be accepted. Do not include any valuables in your bag such as: cellphones, wallets, etc. The Sporting Life 10k is not responsible for damaged, lost or stolen items. Purchased shuttle bus tickets are for PRE-RUN ONLY to take you to the start line. There will be NO shuttle bus service back to the start line after the run. Free shuttle buses will be available to take you to the closest TTC subway station after the run, but remember, you will need a TTC token/PRESTO card or $3.25 cash fare. Where to board the shuttle bus: Buses will be parked on Ontario Place Boulevard. Board the buses from Ontario Place Parking Lot 2A, south of Lakeshore Blvd. What you need to board the shuttle bus: You will be asked to show your bib with the bus icon, proving you have pre-paid for the shuttle service, in order to board the bus. 5:30–6:00AM SHUTTLE BUS: For OUT OF TOWNERS who are picking up their race kit. Race Kit Pick-up will close at 7:00AM sharp. If you take a bus later than 6:00AM, you will miss picking up your race kit. 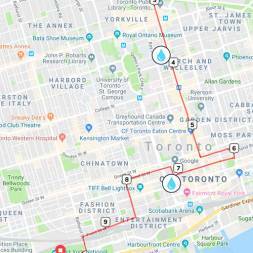 This shuttle bus will be the only one dropping runners off at the Sporting Life store located at 2665 Yonge St. From there, you will walk 1.5km south to the start line at Yonge St. and Davisville Ave. Please plan accordingly. 5:45-6:15AM SHUTTLE BUS: RED or YELLOW corral participants (1st & 2nd wave) should be on this shuttle bus to ensure you’re at the start line for no later than 7:15AM. 6:25AM SHUTTLE BUS: BLUE & GREEN corral participants (3rd & 4th wave) should be on this shuttle bus to ensure you’re at the start line for no later than 7:35AM for BLUE corral and 7:55AM for GREEN corral. 6:30-6:45AM SHUTTLE BUS: PURPLE, ORANGE and PINK corral participants and all WALKERS (5th, 6th and 7th wave) are the ONLY people that should be on the 6:30–6:45AM shuttle buses. Free shuttle buses when you’re finished! Destination: St. Andrew subway station. Bring a TTC token/PRESTO card or $3.25 cash fare. Where to meet: Buses will be parked on Ontario Place Boulevard. Board the buses from Ontario Place Parking Lot 2A, south of Lakeshore Blvd. Cost: FREE! No need to pre-book this shuttle, it will be a first come, first served basis. Awards will be given out on Run Day. We do not provide age group awards. Every registered participant will receive a Finisher Medal at the end of the finish line chute in Coronation Park. This is a wonderful way to remember the day! Customize your medal by ordering an iTAB, a small insert engraved with your name and finishing time that fits neatly into a recess on the back of your medal. Pre-order your engraved iTab online when you register, or add this via your participant dashboard if you’ve already registered. You will receive your iTab by mail 6-8 weeks after the race. Once you cross the finish line, you continue south, past Fleet Street and into Coronation Park for the Post Run Party where you will receive your finisher medal, food, water and sponsor offerings. This is also the location where you can meet your family and friends. The family/friends reunion area will be located at the baseball diamond by the stage in the middle of Coronation Park. Walkers are welcome! PLEASE NOTE: A walker is considered someone who will be walking 100% of the race, not RUNNING/WALKING. The finish line will remain open until 11:00AM. This allows everyone over two hours to complete the route, which is a 12:00 min/km. Due to permit restrictions set out by the City of Toronto, all roads will re-open no later than 11:00AM. If you are still on the route at this time, our course marshals will direct you to the sidewalks. The Sporting Life 10k has implemented a colour-coded Event Alert System (EAS) for our run that will communicate the status of course conditions on run day. The levels range from Low (green) to Moderate (yellow) to High (red) to Extreme (black) based on the weather and other course conditions. On run day, any changes to the EAS status will be communicated via color-coded signs along the course at each water station, as well as by announcements at the start and finish lines. All participants should familiarize themselves with the EAS prior to the run, and remain alert for directions from race officials/volunteers. All runners should take precautions to be prepared for varying course conditions on run day. There will be First-Aid Tents at the 4k and 7k water stations. We will have a Medical Tent at the Finish Line and at the Party Site in Coronation Park. There will be medical personnel on bicycles along the route – from the Start line to the Finish line. Emergency Services may require access to the route in case of an emergency. We ask that you follow any EMS personnel instructions in case of an emergency to ensure that they are able to access the area as safely and quickly as possible. At the Start Line Area – Yonge St. and Hillsdale Ave.
Will be located at the start and finish areas, and at the 4k and 7k Water Stations. Finisherpix.com is the official run photography company and will have photographers at the start, several points along the course, at the finish line and at the post-run party. Emails will be sent to participants after the run with links to view and purchase their race photos. Be sure to take advantage of their Early Bird Discount! Free shuttle buses when you’ve finished!